The Battle of Bumfuck, Iowa is over. Lara, Kaitylyn and Jim have been captured and put in prison, and now Korey, trying to get them out, is also arrested. 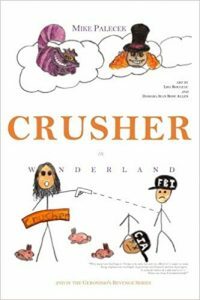 … How will the CRUSHER rebellion against The United States of America continue, as it must? Korey is interrogated, tortured by his C.I.A. captors. Reuben and Hector actually find the treasure in The Underground. Korey escapes from the C.I.A. & now meets Patrick, Henry, Washington and Jefferson. They steal squirt guns from the c-store, fill them in a most unusual way and take to hunting the C.I.A. in downtown Minneapolis. Billy escapes momentarily from the Bumfuck mental hospital and is taken on the scenic route by a few out of this world folks.